The economic case for an independent Scotland was one of the most important battlegrounds before the referendum, and supporters continue to make the case for Scotland’s potential prosperity. A social media graphic produced by pro-independence campaign group Business for Scotland was recently shared more than 2,500 times on Facebook which compares Scotland’s imports and exports to other UK nations. Ferret Fact Service looked at the claim made in this graphic and found it to be Mostly False. The measure this graphic is referencing is the balance of trade (BoT) – the difference between the value of a country’s imports and its exports. Business for Scotland say the source of this claim comes from the HMRC’s regional trade statistics (RTS) data, which lists overseas trade statistics consisting of imports and exports in goods for each UK region, as well as each nation as a whole. Current RTS data goes back to the first quarter of 1996 up until the final quarter of 2017. The figures featured on the UK map in Business for Scotland’s graphic show the BoT at the end of the 2017 financial year for each individual nation, and for the UK as a whole. The calculations for Business for Scotland’s trade figures are the difference between each nation’s overseas exports and imports in goods in 2017. In Scotland, for example, the value of exports (£28.8bn) was £4.6bn greater than imports (£24.4bn). During this period, the RTS figures show Scotland has always exported a greater value of goods overseas than it has imported at the end of each financial year – known as a trade surplus. The second section of the claim in the Business for Scotland graphic is that the other UK countries have either fluctuated or been “persistently negative”. Throughout the period of recorded RTS data, England has always imported a greater value of goods than it has exported – known as a trade deficit. Wales has mostly operated a trade surplus – it did so consistently from 1996 until 2012. Since 2013, Wales has each year operated a trade deficit. Northern Ireland has also mostly operated a trade surplus. The country operated a trade deficit in 1997, from 2000 to 2002, and in 2012. 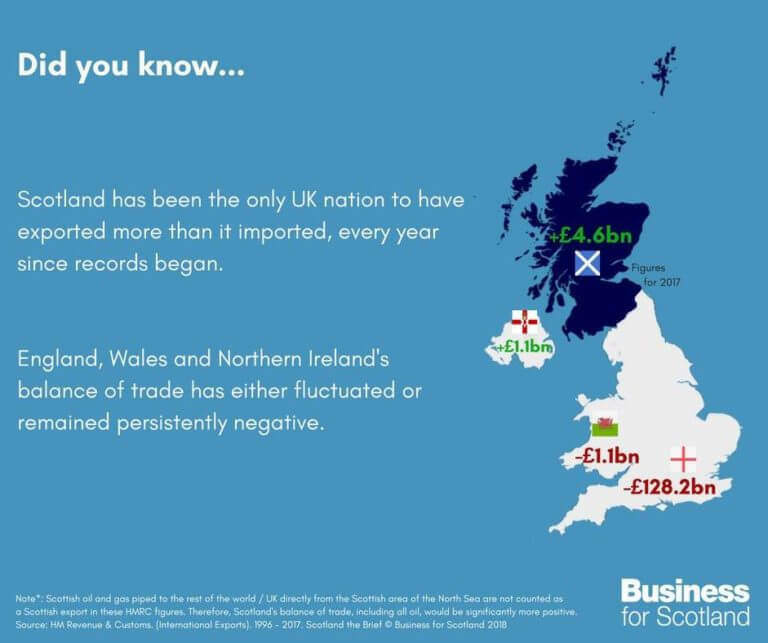 However, these statistics do not account for trade between the nations of the UK, which makes up the majority of Scotland’s exports and imports. The latest figures covering 2016 show exports from Scotland to the rest of the UK had reduced, but still made up 61 per cent of the overall total. Scotland’s overall trading balance is explained in the latest Quarterly National Accounts. It reports that “the estimated value of imports to Scotland from RUK [Rest of UK] and ROW [Rest of World] is higher than the value of exports from Scotland to RUK and ROW, meaning there is a net trade deficit for the onshore economy”. This does not include the potential value of Scotland’s oil and gas reserves, which are not counted as a Scottish export but rather a UK export not tied to a region. It is also noted that the lack of a trade border for Scotland means particularly imports to Scotland can be hard to measure accurately. We must also take into account that the RTS statistics also only measure trade in goods, but not services. This is important because services, which includes things like financial activities and administration, make up a significant part of the UK’s economy, and is the largest part of Scotland’s exports at 49 per cent in 2016. This graphic’s claim that Scotland has run a trade surplus is misleading. 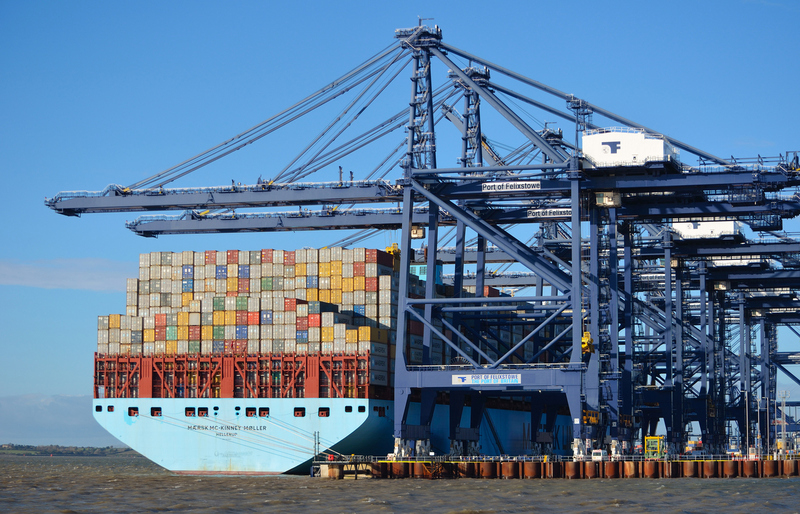 While the HMRC figures show more exports than imports, that does not reflect the full picture of Scotland’s trading position as it only accounts for goods traded overseas. Trade with other UK nations makes up a majority of Scottish trade, and when services are included in the statistics, Scotland is shown to have an overall net trade deficit. In response to a Ferret Fact Service request for evidence, Business for Scotland provided balance of trade data from HMRC. Correction: An earlier version of this fact check did not include wider context around Scotland’s trade in services and within the UK. The RTS data only refers to goods traded between the regions and overseas. This has been reflected in the updated verdict.